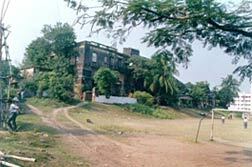 The site known as Chandraketu's fort, a legend without any base was partly excavated by the University of Calcutta from 1956-57 to 1966-67 and has revealed almost a continuous sequence of occupations, divided into 6 periods from the Pre-Mauryan to Pala period. The protected limits consist of an earthen rampart only. The area contains ancient habitational deposits. Besides NBP ware and brick-slipped ware, pieces of rouletted ware, beads, punch-marked and cast copper coins, the site has yielded exquisite terracotta figurines of the Maurya, Sunga and Kushana period. 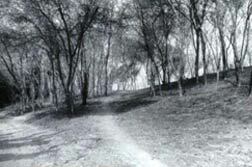 Excavated by the University of Calcutta between 1956-57 and 1966-67 the site forms part of the fortified site of Chandraketugarh and reveals occupational levels ranging from Pre-Mauryan to Pala period. 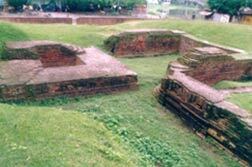 Particularly remarkable among the remains is the presence of a polygonal brick structure which probably represents a temple belonging to the Gupta period. This brick Temple is traditionally connected with an inscription (not traceable now) of one Raja Jayantachandra, purported to have been issued in 975 AD. 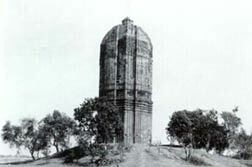 It is evident from an earlier photograph that the temple had considerable architectural merit and closely resembled to Siddhesvara Temple at Bahulara, near Onda in Bankura district on plan, elevation and decorative motifs. There is no deity inside. The temple is datable to c. 10th - 11th century AD on the basis of its architecture. The Monument is situated on a raised ground detached from the surrounding area. The origin of the building is obscure. Perhaps it was a Portugese or a Dutch factory. According to tradition a treaty between Siraj-ud-daulah and Robert Clive was signed in this building on 6th or 9th February 1757. After the battle of Plassey Clive used this building as a country house is suggested by a marble plaque on the front of the building. The building is a fine specimen of Colonial architecture. 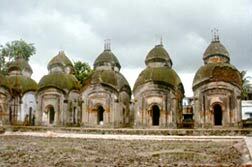 The then landlords of Khardah Sree Ramhari Biswas and Pandit Ramkrishna Biswas founded this unique Temples between c. late 18th and early 19th cent. AD. Altogether there are 26 Shiva Temples divided into two groups, each having its own separate enclosure wall and courtyard. The complex to one's left facing the Ganges has 20 Temples each standing on a approximate 1.5m high podium of bricks, set in lime mortar shows a courtyard in the middle. The complex to one's right consisting of six Temples has similar arrangements like the former. All these 26 Temples having atchala roof follow almost same architectural style. Almost all the Temple walls are embellished with ornate design of creeper, flower, niches and plaster. The double storey brick built building within a compound where some other Government office buildings are located was formerly used as S.D.O. Office, Barasat Sub-Division. The impressive building now in badly dilapidated condition has an imposing arched portico in front. The front wall of the building bears a stone tablet in which it is written "In this house lived Lord Warren Hastings." 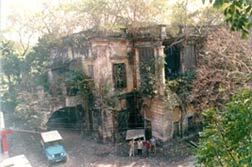 The building in its ruins represents a fine specimen of colonial architecture prevalent during the 18th/19th century and was possibly used by Warren Hastings as his Garden House. The rooms inside the frontal opening at ground floor represent badly ruinous state as the wooden ceiling has almost collapsed in many places.